Mitt Romney, the 2012 Republican presidential nominee, did not win his race for the White House, but in his first post-election interview today on "Fox News Sunday," he wants everyone - friends and foes alike - to know that he's not exiting stage right. In a wide-ranging discussion, the former Massachusetts governor and his wife, Ann Romney, opened up on the reasons for their loss, their adjustment to life after the campaign, and President Obama's leadership since his reelection, making clear that they were disappointed by the loss, but even more disappointed about the direction the country has taken since then. "Nero is fiddling," Romney said, likening the president to the infamous Roman emperor who played his fiddle as Rome burned. "No one can think" that the fight over the sequester "has been a success for the president," Romney argued. "He didn't think the sequester would happen. It is happening, but to date, what we've seen is the president out campaigning to the American people, doing rallies around the country, flying around the country, and berating Republicans." He suggested that the president may be more interested in "showing pain" and wielding the sequester as a weapon against Republicans than in actually finding compromise. And that adversarial, campaign-style politicking, Romney said, has poisoned the well of compromise instead of enabling the president to engage with opposition. "I don't see that kind of leadership right now," he said, and "it kills me not to be in there, not to be in the White House" to provide that direction. Instead, after his loss, he watches, more bystander than inside player. But until the very end, Mitt Romney said, he was convinced that it would turn out differently. "We were convinced that we would win." When talking about the moment it became clear, after the numbers from Ohio began rolling in on election night, that victory was slipping out of reach, he said "it's hard, it's emotional." Ann Romney described the "crushing disappointment" she felt - "Not for us, our lives are going to be fine. It's for the country." "For me, yeah, I cried," she said. Mitt Romney likened his exit from the campaign trail to stepping off an amusement park ride. "We were on a roller coaster - exciting and thrilling, ups and downs," he explained. "But the ride ends, and then you get off." And despite the unfortunate outcome, Romney said he does not dwell on what might have been. "I went through a number of my mistakes, I'm sure...but you move on. I don't spend my life looking back. It's like, OK, what are we going to do next?" "I think it takes time," Ann Romney added. "I'm mostly over it." Shortly after the election, Romney made the case to donors that the Obama administration's "gifts" to various constituencies had helped secure his reelection. Critics saw echoes of Romney's "47 percent" tape, publicized during the heat of the general election, in which he characterized Obama voters as "victims" who felt "entitled" to government services. Romney apologized once more for the "unfortunate" remark about the "47 percent" but did not back down one bit from the thrust of his "gifts" argument. "The presidency had the power of incumbency," he explained. "Obamacare was very attractive, particularly to those without health insurance." He was considerably more contrite about his earlier remarks, admitting: "It was a very unfortunate statement that I made. It's not what I meant. "When you speak in private," he explained, "you don't spend as much time thinking about how something could be twisted and distorted." 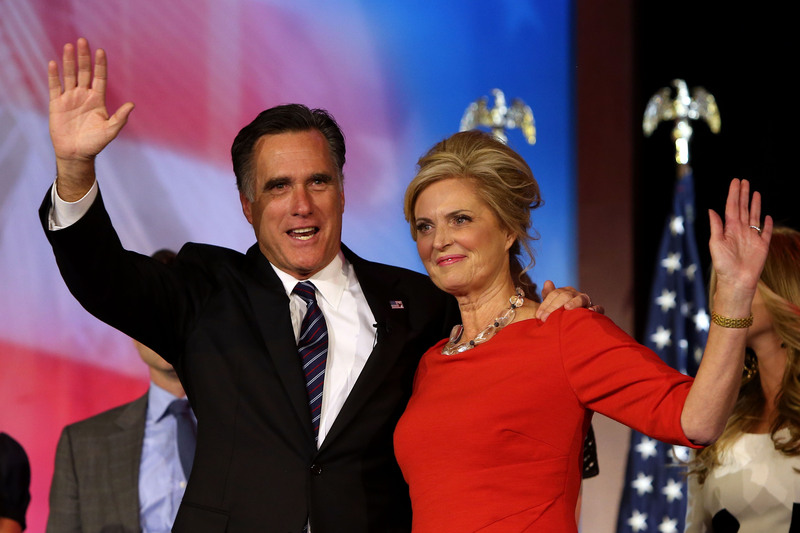 Ann Romney, for her part, seemed to bristle still at criticism of her husband. "I'm like a she-lion when it comes to defending Mitt," she said. "I know his heart, I know his abilities, I know he would have been a fabulous president." Asked whether she thought the Obama campaign's attacks on her husband were fair, she responded with a quick and decisive "no." "And I mourn the fact that he's not there" in the White House, she said. "I totally believe, at this moment, if Mitt were there in the office, that we would not be facing sequestration right now." Ann was asked about rumors that she and eldest Romney son Tagg, dissatisfied with the tenor of the debate, pressured the campaign to "let Mitt be Mitt," and she said: "Of course it's true, but it's not just the campaign's fault, I believe it was the media's fault as well." "I'm happy to blame the media," she explained, because "there's more bias in favor of the other side...that's a pretty universally felt opinion." Romney said that he had renamed his foundation the Romney Foundation for Children, which will focus on helping "the very poorest kids in the world." He is also scheduled to speak at the Conservative Political Action Conference, a gathering of conservative leaders in Washington, D.C., next month. Going forward, Romney signaled a desire to continue advising the GOP but recognized that his opinion may not be of paramount importance to a party struggling to retool in the wake of his loss. "I recognize that I lost, so I'm not going to be the leader of the Republican Party," he said. "But I want to have influence on getting our party to a position where we can be successful." In the future, Romney said, "we have to do a better job bringing minority voters into voting for Republicans." "People who have come here illegally," he said, "should not be given a special pathway to citizenship or permanent residency in this country." Ultimately, Romney said, his concern is about the future. "I care about my 20 grandkids and what kind of America they are going to have," he explained. "And sitting on the sidelines when so much is at stake is just not in my nature."